Audio connectors and video connectors are electrical connectors (or optical connectors) - plugs and sockets - for carrying audio signal and video signal. Audio interfaces and video interfaces define physical parameters and interpretation of signals. For digital audio and digital video, this can be thought of as defining the physical layer, data link layer, and most or all of the application layer. For analog audio and analog video these functions are all represented in a single signal specification like NTSC or the direct speaker-driving signal of analog audio. Physical characteristics of the electrical or optical equipment includes the types and numbers of wires required, voltages, frequencies, optical intensity, and the physical design of the connectors. Any data link layer details define how application data is encapsulated (for example for synchronization or error-correction). Application layer details define the actual audio or video format being transmitted, often incorporating a codecs not specific to the interface, such as PCM, MPEG-2, or the DTS Coherent Acoustics codec. In some cases, the application layer is left open; for example, HDMI contains an Ethernet channel for general data transmission. For efficiency and simplicity, the same codec or signal convention is used by the storage medium. For example, VHS tapes can store a magnetic representation of an NTSC signal, and the specification for Bluray discs incorporates PCM, MPEG-2, and DTS. Some playback devices can re-encode audio or video so that the format used for storage does not have to be the same as the format transmitted over the A/V interface (which is helpful if a projector or monitor cannot handle a newer codec). Composite, S-Video, and Component VIVO = Mini-DIN 9 Pin with breakout cable. HDMI combines DVI-compliant uncompressed video data with compressed or uncompressed audio, and supports other protocols. FireWire is used on Camcorders, commonly ones using MiniDV tapes, and high-end audio equipment. 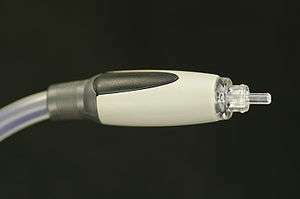 The electrical coaxial cable (with RCA jacks) or optical fibre (TOSLINK). Note that there are no differences in the signals transmitted over optical or coaxial S/PDIF connectors—both carry exactly the same information. Selection of one over the other rests mainly on the availability of appropriate connectors on the chosen equipment and the preference and convenience of the user. Connections longer than 6 meters or so, or those requiring tight bends, should use coaxial cable, since the high light signal attenuation of TOSLINK cables limits its effective range. High-Definition Multimedia Interface (HDMI) is a compact audio/video standard for transmitting uncompressed digital data. 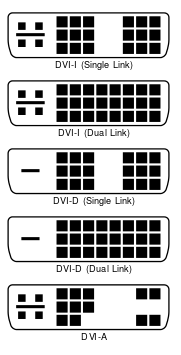 There are three HDMI connector types. Type A and Type B were defined by the HDMI 1.0 specification. Type C was defined by the HDMI 1.3 specification. Type A is electrically compatible with single link DVI-D. Type B is electrically compatible with dual link DVI-D but has not yet been used in any products. IEEE 1394 FireWire is a digital data transfer protocol commonly used for digital cameras (common on MiniDV tape camcorders), but also used for computer data and audio data transfers. In the United States, cable TV converter set top boxes by law also have the connection for transferring content directly to a TV (if equipped with a port) or computer for viewing. 1394 can also use coaxial cable as a medium for longer runs. Unlike Point-to-Point connections listed above, IEEE 1394 is able to host several signals on the same wire, with the data delivered and shown on the destination set. It is also fully bi-directional, with its full bandwidth used in one direction or the other, or split directions up to its maximum. DisplayPort is a digital display interface standard (approved May 2006, current version 1.4 published on March 1 2016). It defines a new license-free, royalty-free, digital audio/video interconnect, intended to be used primarily between a computer and its display monitor, or a computer and a home-theater system. 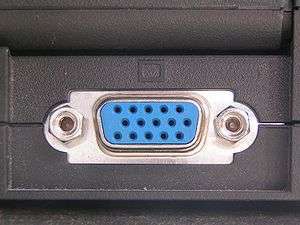 The video signal is not compatible with DVI or HDMI, but a DisplayPort connector can pass these signals through. 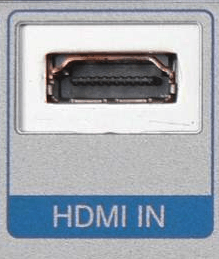 DisplayPort is a competitor to the HDMI connector, the de facto digital connection for high-definition consumer electronics devices. 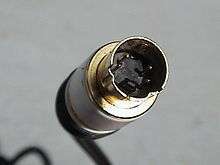 Audio connectors are used for audio frequencies. They can be analog or digital. Fahnestock clips on early breadboard radio receivers. Phone connector also known as tip-ring-sleeve (TRS) or tip-sleeve plug, phone plug, jack plug, mini-jack, and mini-stereo. This includes the original 6.35mm (quarter inch) jack and the more recent and standard 3.5mm (miniature or 1/8 inch) and 2.5mm (subminiature) jacks, both mono and stereo (balanced) versions. 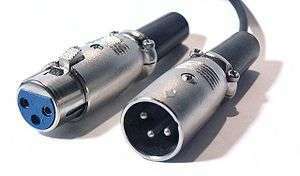 XLR connectors, also known as Cannon plugs, used for analog or digital balanced audio with a balanced line. S/PDIF, either over electrical coaxial cable (with RCA jacks) or optical fiber (TOSLINK). 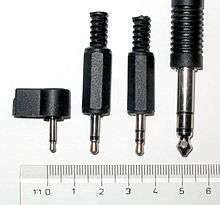 A phone connector (tip, ring, sleeve) also called an audio jack, phone plug, jack plug, stereo plug, mini-jack, or mini-stereo. This includes the original 6.35mm (quarter inch) jack and the more recent 3.5mm (miniature or 1/8 inch) and 2.5mm (subminiature) jacks, both mono and stereo versions. A DIN connector is a connector that was originally standardized by the Deutsches Institut für Normung (DIN). Mini-DIN is a variation. TOSLINK or Optical Cable is a standardized optical fiber connection system. Digital audio interfaces and interconnects with the AES/EBU interface also normally use an XLR connector. 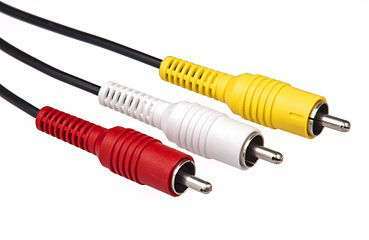 RCA connectors, also known as phono connectors or phono plugs, are used for analog or digital audio or analog video. These were first used inside pre-World-War-II radio-phonographs to connect the turntable pickup to the radio chassis. They were not intended to be disconnected and reconnected frequently, and their retaining friction was quite sufficient for their original purpose. Furthermore, the design of both cable and chassis connectors was for minimum cost. Initially intended for audio frequency connections only, the RCA plug was also used for analog composite video and non-critical radio-frequency applications. 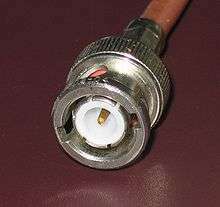 D-subminiature or D-sub is a common type of electrical connector used particularly in computers. Calling them "subminiature" was appropriate when they were first introduced, but today they are among the largest common connectors used in computers. The DB25 is used for multi-track recording and other multi-channel audio, analog or digital (ADAT interface (DB25)). Video In Video Out, usually seen as the acronym VIVO (commonly pronounced vee-voh), is a graphics card port which enables some video cards to have bidirectional (input and output) video transfer through a Mini-DIN, usually of the 9-pin variety, and a specialised splitter cable (which can sometimes also transfer sound). VIVO is found predominantly on high-end ATI video cards, although a few high-end NVIDIA video cards also have this port. VIVO on these graphics cards typically supports Composite, S-Video, and Component as outputs, and composite and S-Video as inputs. 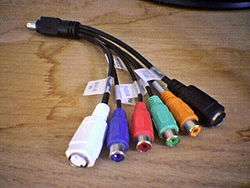 Many other video cards only support component and/or S-Video outputs to complement Video Graphics Array or DVI, typically using a component breakout cable and an S-Video cable. The Digital Visual Interface (DVI) is a video interface standard designed to maximize the visual quality of digital display devices such as flat panel LCD computer displays and digital projectors. It is designed for carrying uncompressed digital video data to a display. † Although the mic input is usually mono, the input is still a TRS phone socket. Many mono 'computer' mics are fitted with TRS plugs. The tip is for the MIC and the ring is for power (to power an electret-condenser style MIC). Hosa cables use grey and orange for left and right analogue channels. RadioShack cables sometimes use grey and black for left and right. Older sound cards had non-standard colour codes until after PC 99, prior to that there were no colors at all. Older sound cards had no common standard color codes until after PC 99. The PC System Design Guide (also known as the PC 97, PC 98, PC 99, or PC 2001 specification) is a series of hardware design requirements and recommendations for IBM PC compatible personal computers, compiled by Microsoft and Intel Corporation during 1997–2001. PC 99 introduced a color code for the various standard types of plugs and connectors used on PCs. † Though the input is often mono, the actual connector is usually still a 3-conductor TRS phone minijack. Many mono computer microphones have 3-conductor TRS plugs. 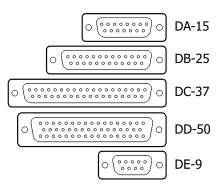 Newer connectors are identified by their shape and not their colour. ↑ "Archived copy" (PDF). Archived from the original (PDF) on 2011-06-06. Retrieved 2010-06-04. Demonstrating the multi-device capabilities of IEEE A/V network. ↑ 2.5mm Audio Cables Archived September 26, 2013, at the Wayback Machine.